The West Elk u19 boys soccer team was handed a punishing loss at the hands of New Castle United on Saturday, April 28, falling 8-1 when all was said and done. New Castle is a formidable club from the I-70 corridor with five teams at the u19 age level and United ranks up among one of their stronger programs. The game opened with each team looking to set the tone with quick play and pressing attacks but United struck first in the 16th minute, finishing on a quick cross through traffic inside the six-yard box. The game swung in favor of New Castle as time wore on, but West Elk’s back line was formidable in holding off repeated attacks. The constant pressure soon gave way to a second goal from New Castle in the 29th minute and they tacked on a third goal in the final five minutes of the first half for a 3-0 lead. The game turned from bad to worse in the opening five minutes of the second half. West Elk came out slow and New Castle took immediate advantage, netting their fourth goal of the game 45 seconds into the second half. West Elk earned a brief reprieve as they picked up play and pressed into New Castle’s half. 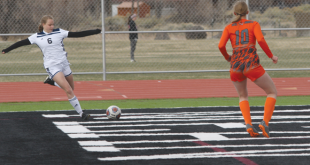 A series of passes led to a drop to Henry Bryndal and Bryndal popped his shot from 40 yards out over the United keeper for West Elk’s first goal of the game. Unfortunately, the goal merely poked the New Castle hornet’s nest as they responded with two more goals in the ensuing 15 minutes of play. As West Elk looked to hold off the United attack, New Castle kept on coming with quick passing through the midfield to set up a number of opportunities. Goalie Slater Weil made the saves he could, including stopping a penalty kick, but New Castle proved too much for West Elk as they eventually closed out the 8-1 win. 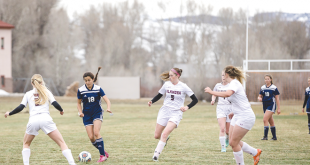 West Elk will host two more games this weekend as they face OCSA on Saturday, May 5, time TBD and then Montrose on Sunday, May 6 at 2 p.m.
“We need to get our midfielders more involved defensively and try to find and take more shots and hopefully come away with a win,” says Aguirre.